A global nonprofit needs a powerful way to share its mission, impact, and goals with readers everywhere—on print and on screen. Results for Development (R4D) is a global nonprofit organization working with partners in more than 55 countries to find new ways to help people escape poverty and reach their full potential. Although we have a previous history with R4D, they contacted us again to help with their first annual report after seeing our publications completed with other clients, like ONE. For this project, the scope included a print component, an online interactive piece, and an announcement email. For this project, the scope included a print component, an online interactive piece, and an announcement email. All pieces needed to represent three important tenets of their organization: education, government, and health. 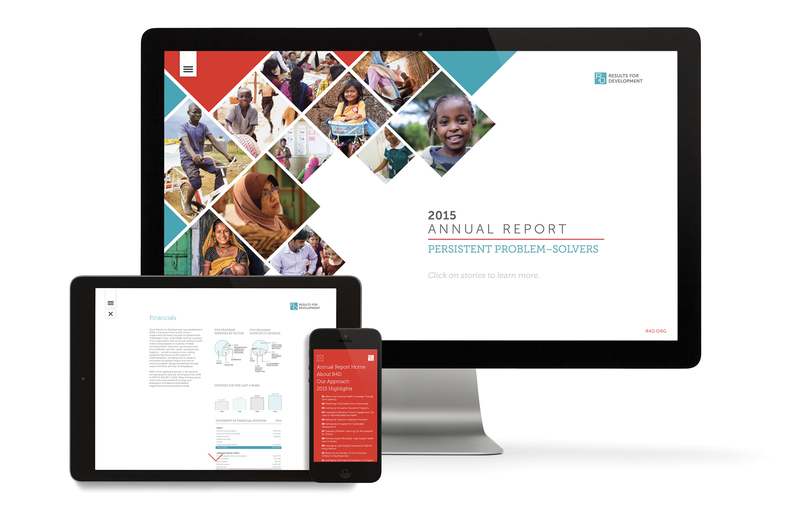 In addition to their dynamic content requirements, this was R4D’s first ever annual report, so our team introduced them to our development process. During production, we used a wide range of images and styles to represent the organization’s progress throughout the report. Our approach was proactive: we paired brand guidelines that we had previously developed for R4D with modern and unique styles, resulting in a final product fluid enough to extend across channels. Because this report was being published on both print and the web, it was important to create a flexible design that was readable on multiple screen sizes without losing the integrity of the design. Results for Development was extremely happy with our work. It was a rewarding project in more ways than one: we were able to work closely with an empowering organization while witnessing our brand work come to life. The multi-component project allowed our team to think in an integrated and interactive way, leading us to a more efficient process with our web developer for the quickest turnaround time for their online report. Check out the digital version of the 2015 Annual Report.